Lord, You are all-knowing, all-powerful, all-good, and all we need. You created us. You sacrificed Yourself to save us. You rose for us. You live for us. Thank You. Thank You. Thank You, Lord! Mighty and merciful Father, thank You for providing for us, protecting us, and empowering us to persevere with courageous faith rooted in Your life-transforming love. When we’re tempted to let discouragement or discontent douse our joy, please remind us of how much You’ve done for us, how much You’ve given us, how much You’ve proven You care for us. When we’re tempted to complain about how tough our situation seems or how unfair the hand we’re dealt feels, remind us that there are so many things that could have happened that You protected us from. Your great purpose prevails every time You answer our prayers, even when You answer with a no or a wait. Your faithfulness endures during the unexpected U-Turns and delays You planned with great care. 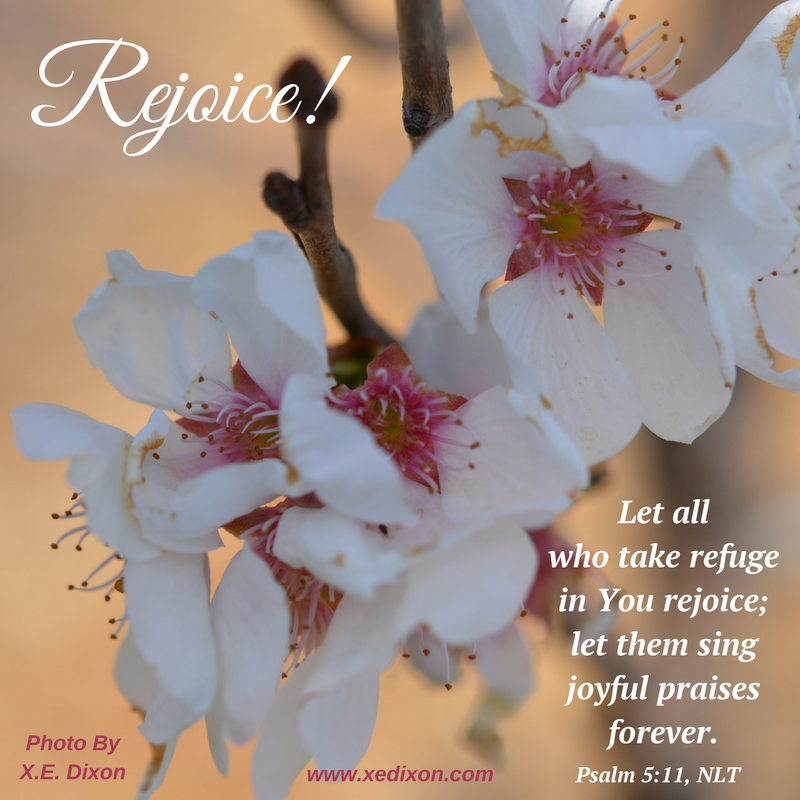 As we take refuge in You, as we trust Your power and Your love, as You help us submit to Your authority and find comfort in Your perfection, please help us overflow with joyful praise. We love You and are overwhelmed with the thought of how deeply You love us. Lord, please ensure the eternal truth of Your endless love for us sinks deep into hearts. You love us. Oh, how You love us, Lord. Photo taken by and meme created by Xochitl E. Dixon. Why Should I Love God When . . . I’ve Got All I Need? Before I surrendered my life to Christ, I had it all. At least I thought I did. Though I’ve never been rich, I’ve always had plenty. I didn’t have the best, but what I did have was good enough for me. Though I experienced trials, I was tough. I got through them on my own, unscathed. I managed to get along just fine. At least I thought I did. I was a good person. I didn’t do anything really bad. I believed in God, even though my twisted perspective painted Him as a punishing avenger, not a loving Father. I figured as long as I kept doing the right things and worked hard, I’d earn and deserve everything I had. I could be content with simply getting by. At least I thought I could. My idolatry of self-sufficiency and comfort blurred my desperate need for a Savior. Of course, I prayed when I needed God to do something for me, to spare me from loss or pain, to give me what I wanted, or to make things go my way. But I wanted all of that for nothing. When it came to be investing in or sacrificing for God, I’d clam up. My attitude then reminds me about the Rich Young Ruler who came to Jesus looking to inherit eternal life (Mark 10:17-31). He wanted the benefits the Lord offered to His followers, at no cost to himself. This man claimed to have obeyed every single commandment since childhood (v. 20). Seriously? He never once disrespected his parents or told a lie? Never? Ironically, the rich young ruler didn’t even realize he was breaking the first commandment (Exodus 20:3) when he placed himself and his riches above God. While Jesus could have slammed him over the head with the Truth, He chose to respond by loving him (v. 21). The Lord didn’t chastise him, condemn him, or even mock him. In love, Jesus invited him to step into his inheritance, which surpassed all expectations and promised an abundant life in God’s presence (v. 21). What one condition did the Lord give in order for the man to receive this priceless gift? Jesus wanted His rightful throne, to be Lord of his whole life, to be trusted as the man surrendered everything for Him−the Giver of all good things (v. 21). But the man grieved and walked away (v. 22), placing temporal gratification and a false sense of security over the eternal benefits of following Christ. I’ve been guilty of withholding from God, too, before I surrendered my life to Jesus and even in some areas of my life now. At times, I’ve clung to friendships I should have released into His hands, as I walked away. I’ve guarded my emotions, afraid to let Him decide how to work in my heart and in the hearts of those I loved. I’ve hesitated to put God ahead of everything and everyone else, wary of trusting Him by giving Him my all, afraid of how my commitment to Him might lead to problems in family relationships, or even in my relationships with members of my church family. I’ve allowed worry to limit my generosity, anxious that I wouldn’t be able to afford my increasing medical bills. But God’s proven His faithfulness when I gave Him everything in the past. He’s reminded me time and again that He’s trustworthy when I give generously from what He’s given me, when I give Him back everything He’s given me. 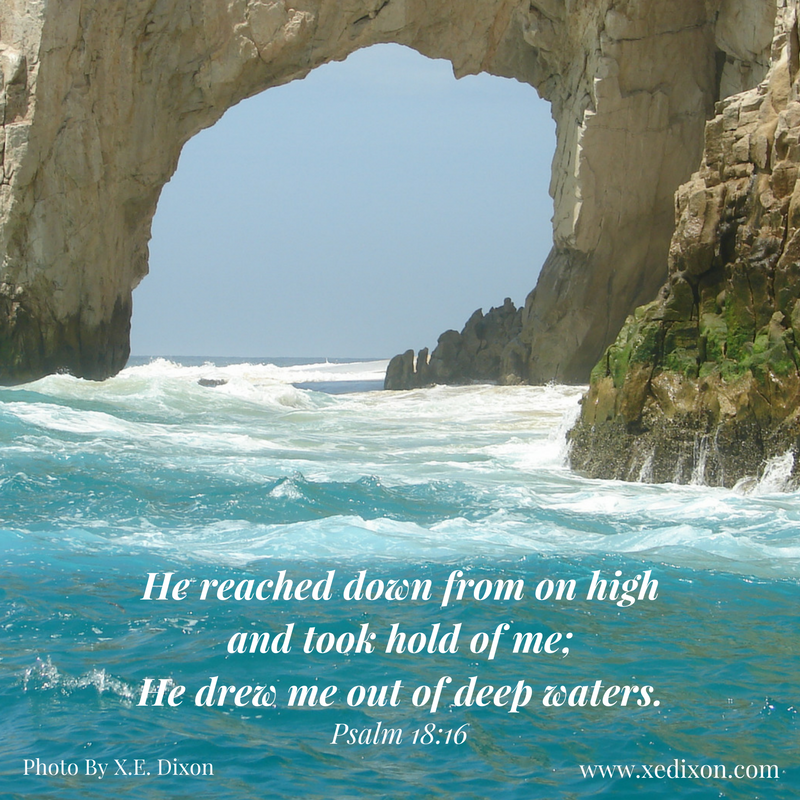 So, I’m asking the Lord to help me surrender completely, to give Him all of me, fearlessly. It won’t be easy, but it won’t be impossible with God. Giving means we risk not having, we risk losing, we risk hurting. But just as the Lord assured the rich young man and His disciples, He promises His love can be trusted and His provisions would always abound and satisfy. He also affirms we’ll endure persecution and experience trials on this side of the earth, though our hope is secured in eternity with Him (vv. 29-30). A beautiful thing happens when we submit to loving our loving God. He transforms our hearts and minds and our perspective changes from temporal to eternal. We no longer desire to place ourselves, our needs, our wants, our dreams, or even our fears, in a place of importance that only belongs to the Lord (v. 31). The rich young ruler held back his wealth from God. But we can withhold many other things from the Lord. Whatever or whoever we refuse to entrust to Him, whatever or whoever comes before God, whatever or whoever we can’t stand the thought of losing or giving up, becomes our treasure. We cannot fully love God if we refuse to relinquish our rights and place Him in His rightful place as Lord, in every aspect of our lives. Scary? Maybe. But not as much as a life willingly separated from God. There is nothing we have that wasn’t created, made possible, and given to us by God. Every skill, ability, dream, gift, and source of joy in our lives was created by and entrusted to us by our loving God. He can be trusted, because of His unending love for us. Why should we love God when we’ve got all we need? Because Christ is all we need. “He is the image of the invisible God, the firstborn over all creation. For by Him all things were created: things in heaven and on earth, visible and invisible, whether thrones or powers or rulers or authorities; all things were created by Him and for Him. He is before all things, and in Him all things hold together. Is there something or someone you are refusing to place in God’s loving hands, something or something you don’t trust Him with? 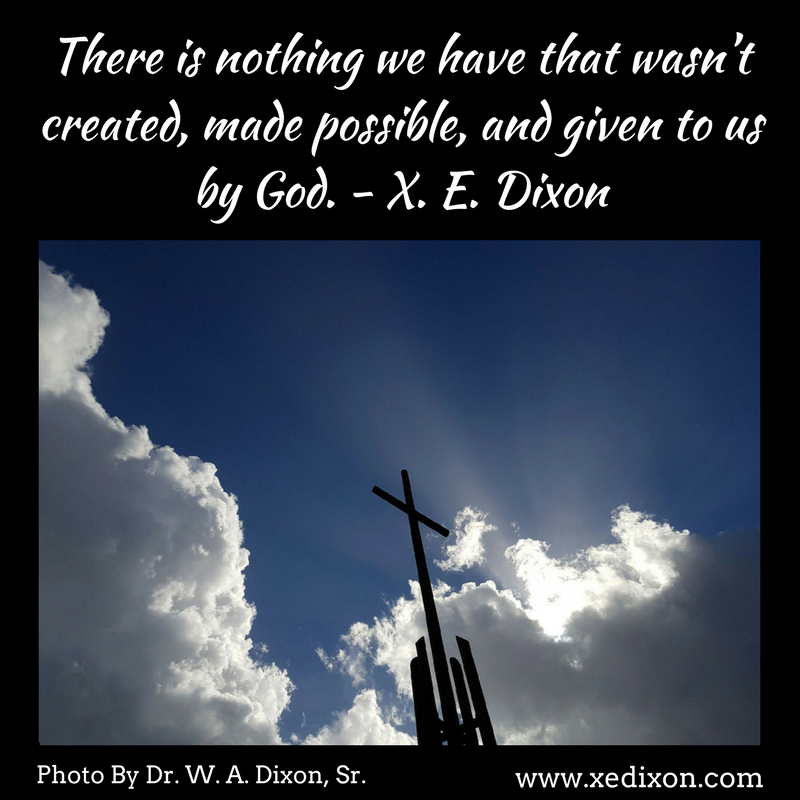 Photo taken by Dr. W. Alan Dixon, Sr. and meme created by Xochitl E. Dixon. Oh, Loving God, You’re So Good to Us! 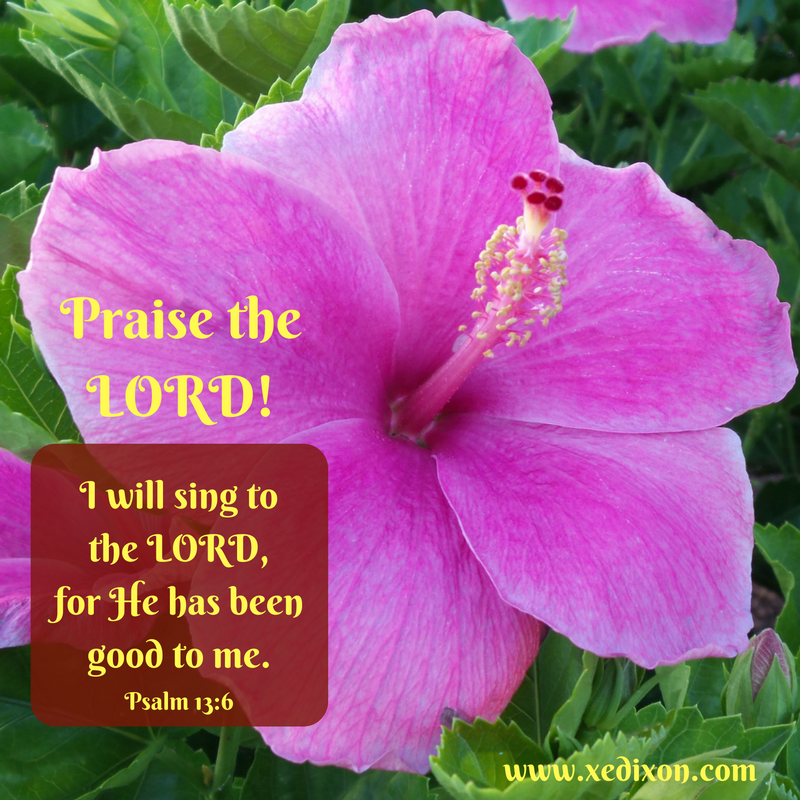 Lord, You are so good to us! Thank You for the privilege of knowing You, loving You and praising You. Thanks for the countless opportunities You give us to see Your goodness, Your faithfulness, and Your life-transforming love penetrating our lives. Please help us acknowledge You in the ordinary moments we experience today. Help us recognize the ways You work in and through the encounters we have with others. There are so many ways You’ve been good to us, Lord. There are so many priceless memories that shine with evidence of Your interactive and intimate love flowing in and through us. Please help us start our days and end our days by counting the ways, listing the ways, sharing the ways, and praising You for the ways You’ve shown love to us every single day. Thank You, Lord, for being good to us. Thank You for being You−our wonderful, glorious, and marvelous King, our faithful, loving, and altogether good Savior. You are the only One who was and is and always will be, the only One who remains the same yesterday, today, and forever. You are the only One whose love can satisfy us completely, the only One who deserves all of our love, all of our worship, and all of our grateful praise. Do You Want to Love God More, or Explore the Life-Changing Depth of His Love for You? There have been times in my life when I acknowledged God, but didn’t really devote myself to Him or live like I believed what He said in the Bible. There have also been times when I didn’t think I needed God, when I didn’t care about God, when I withheld from God. I’ve been angry at, disappointed in, and afraid of God. I’ve ignored Him and tried running from Him. I’ve begged God to see me, hear me, help me, forgive me, change me, to prove Himself to me. Though I believed God existed, He couldn’t possibly love about me, especially after I’d repeatedly blown it, messed up, and hurt myself and others. I doubted God’s love when others hurt me, too. But even when my faith faltered, God stayed lovingly, constantly present−pursuing and protecting me, preparing my heart to accept all of Him and all He freely offered me. After I accepted Jesus as my Lord and Savior, I still struggled with praying and believing God’s promises applied to me. The Lord surrounded me with people who knew Him, loved Him, and taught me how to nurture my own love-relationship with God through the prayerful study of the Bible. The more I read, the more questions popped up. Why I should love God when I had plenty, when I lacked much, when I bubbled with happiness, and when I suffocated with sorrow? Why should I love God when I could handle life’s trials without anyone’s help, especially when God wasn’t fixing what I told Him needed fixing? How could God possibly love me, when there were times I didn’t even like myself? Why did I keep expecting others to meet my needs, when God provided everything for me? Oh, yes, I went there too many times. Now, I can’t stop thanking God and telling others about His unending grace, limitless love, and infallible truth. As I enter year five of one of the hardest seasons I’ve experienced since accepting Christ as my Savior, I’ve never felt so loved by God and I’ve never loved God more. O Lord, thank You for loving me through the mountaintop moments of abundance, the deep valleys of affliction, and the flatlands of my ordinary, mundane, average-Josefina days. As I share my next blog series, “Why Should I Love God When . . .,” I look forward to praying with you and being blessed by your input in the comment section. 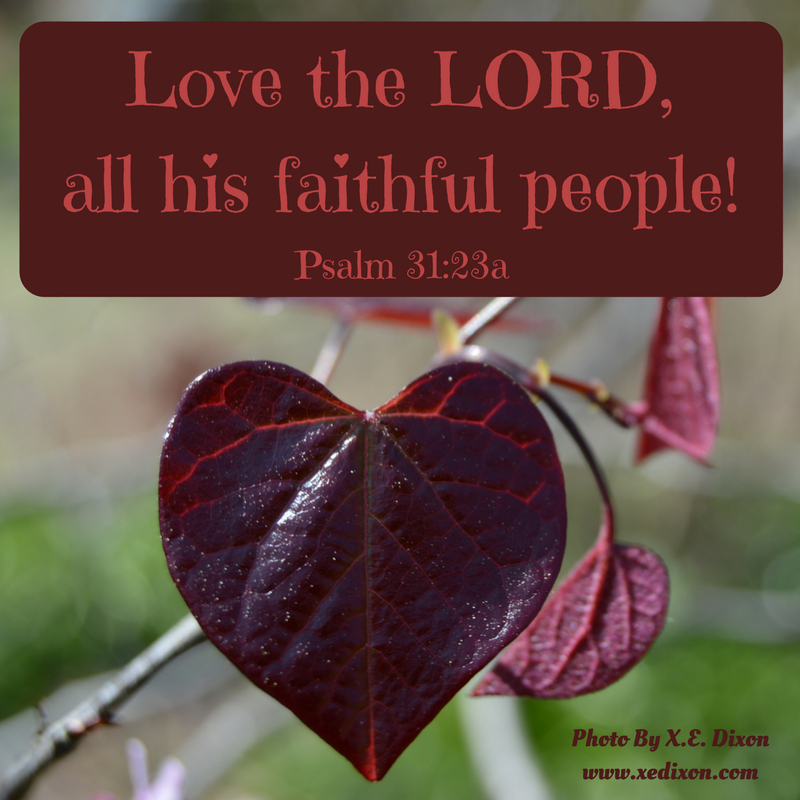 You can find all of the posts in this series under the “Loving Our Loving God” tag. I hope you’ll join me in celebrating God’s love and exploring the depth and life-changing impact of His relentless, endless, priceless love for us−His beloved children. A woman rejected, her reputation scorned, changed forever by a scandalous meeting and an unexpected showering of redemptive grace. Not only does this describe my life before Christ, these are the puzzle pieces that make up one of the most extraordinary God encounters in the New Testament. On His way back to Galilee, Jesus led the disciples through Samaria. Samaria, the place condemned by prophets in the book of Hosea (7:1; 8:5-7). Samaritans, a mixed race seeped in idolatry and despised by orthodox Jews. So, naturally, Jesus decided to swing through Samaria and chose Jacob’s well as a perfect rest-stop. Scripture says the disciples went for food. Were they grumbling about having to associate with the people they grew up learning to hate, as the Lord sat by the well, waiting to rock the politically correct boat? The Bible says when the Samaritan woman came to draw water from the well, Jesus asked her for a drink (v. 7). Though first-century Jewish tradition considered women less-than and Samaritans were quite a few notches below less-than (v. 9), the attitudes of others didn’t affect Jesus. He chose this particular woman for this particular encounter, knowing she also wore a badge of disdain stitched by a string of bad choices. Her surprise at Jesus’s request resounded with each syllable. This woman’s armor held strong, though dented and dinged by past judgements and labels she’d accepted as her personal present-truth. Did her shield of confidence hide a fear of being condemned again, for the past she couldn’t change? Was she afraid this stranger would find out what her community wouldn’t let her forget? Although Scripture doesn’t record her actions, I imagine this sister narrowing her eyes as she focused on what she could see, what made sense, what she could prove. The man had nothing to draw water from the well. How could Jesus offer her anything she couldn’t get for herself? Talk about a great example of the insanity that we call self-help. How many times have I insisted I could do what only God can do? How many times have I determined this time would be different, if only I had more faith, if only I tried harder or made better choices, if only I denied my past, fixed myself, or changed my circumstances? How often have I depended on my own abilities and strength, only to come up wanting more, wanting something different, or being stuck in the endless cycle of wanting something else as I search for satisfaction? After Jesus whet the Samaritan woman’s appetite with the promise of eternal life (v. 13), He established His power was like none she’d ever imagined (vv. 15-18). Still, she slipped back into the comfort of her limited knowledge (v. 19-20). What happened when Jesus opened the horizon before her and allowed her to taste the sweetness of possibility (vv. 21-24)? Hope requires risking disappointment, accepting rejection, and often surrendering our will because we dare to trust the goodness and faithfulness of the Giver. Doubt paves a safe trail, a worn path that circles our fears and insecurities, like scavenging buzzards waiting to devour any thought that dares entertain the possibilities of that something more that would finally be enough. What the Samaritan woman knew, or thought she knew, would feel safer than being stretched beyond the realm of her understanding. From other encounters recorded in the Bible, it’s not hard for me to imagine Jesus leaning toward the woman, lowering His voice, and placing His hand over the knuckled grip that secured her empty bucket. Each syllable flowed from His mouth refreshing her parched heart. Could Jesus be the One she’d been waiting for, the hope, the peace, the way, the truth, and the life she’d been seeking for so long? Jesus made time for her. He listened to her, cared about her. He extended grace and accepted her, even though He knew everything about her. Jesus offered to give more than she deserved or even dared to dream of asking for, instead of take-take-taking from her. The Lord loved her enough to reveal Himself to her, personally, intimately. And then, He used her to reach others, to spread His love and truth, to lead others to Him. He wants to do the same for us. No matter what our past holds. No matter what our present situation. Jesus invites us to drink deep of His compassion, His unconditional love, grace, peace, and forgiveness. Jesus accepts us as we are, but through intimate love-encounters He transforms us into someone new. 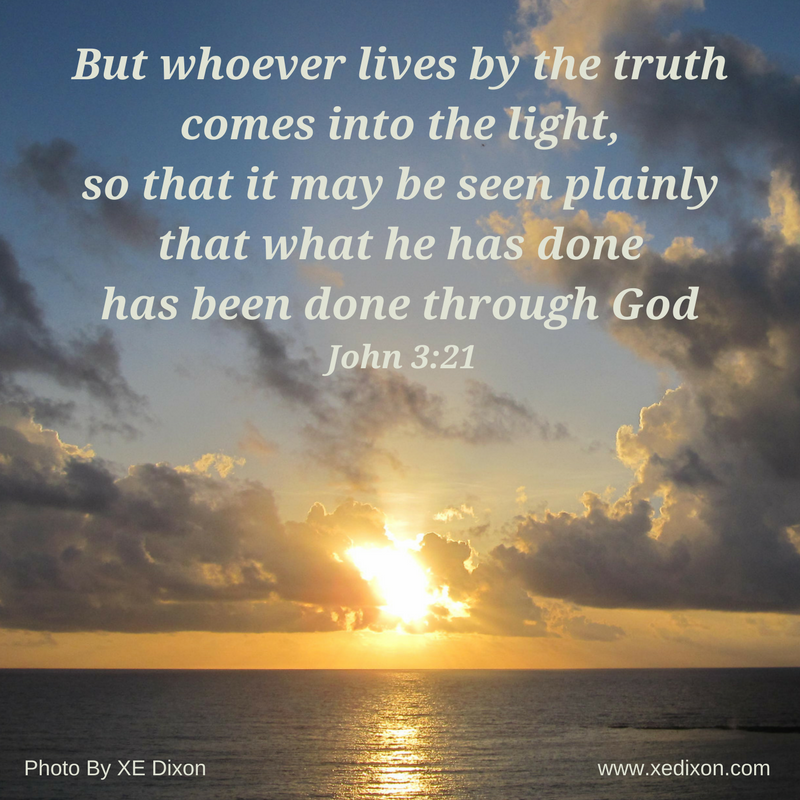 When the Lord speaks to us through His Word, He illuminates His truth through His Spirit. 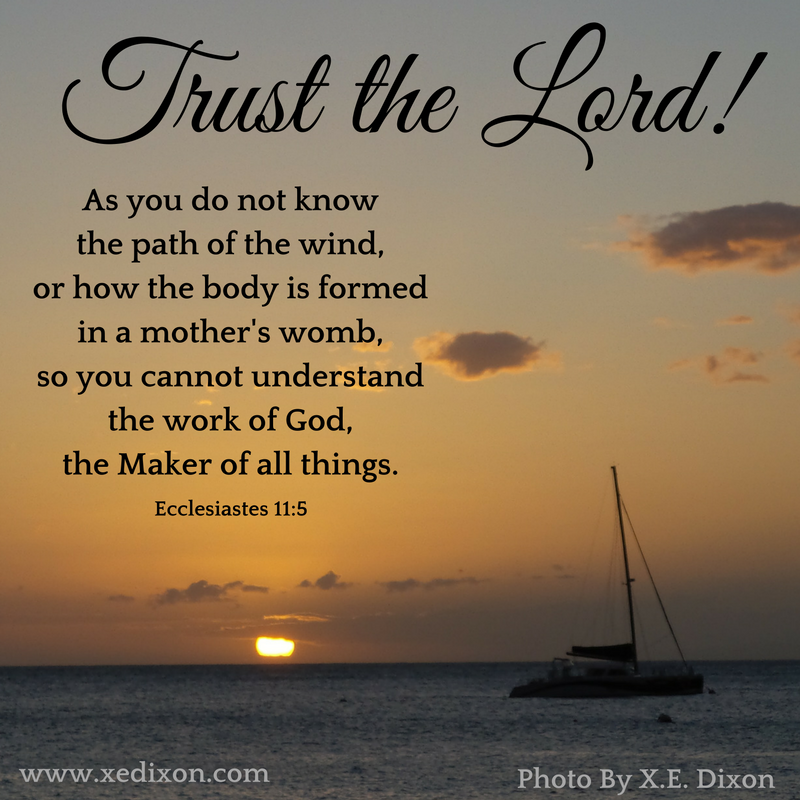 He helps us interpret those words in the context in which He presented them, showing us how His truth applies to this life He’s entrusted to us. As we prayerfully receive the God-breathed words of Scripture, we can believe the Lord is definitely talking to us. Lord, please help us believe what You say over what we think, or what others think about us. Help us hear You clearly, believe You completely, and heed You courageously all the days of our lives. In Jesus’s name, Amen. Photo taken by and meme created by Xochitl E. Dixon. The handsome model is my amazing husband. God has been good to us! 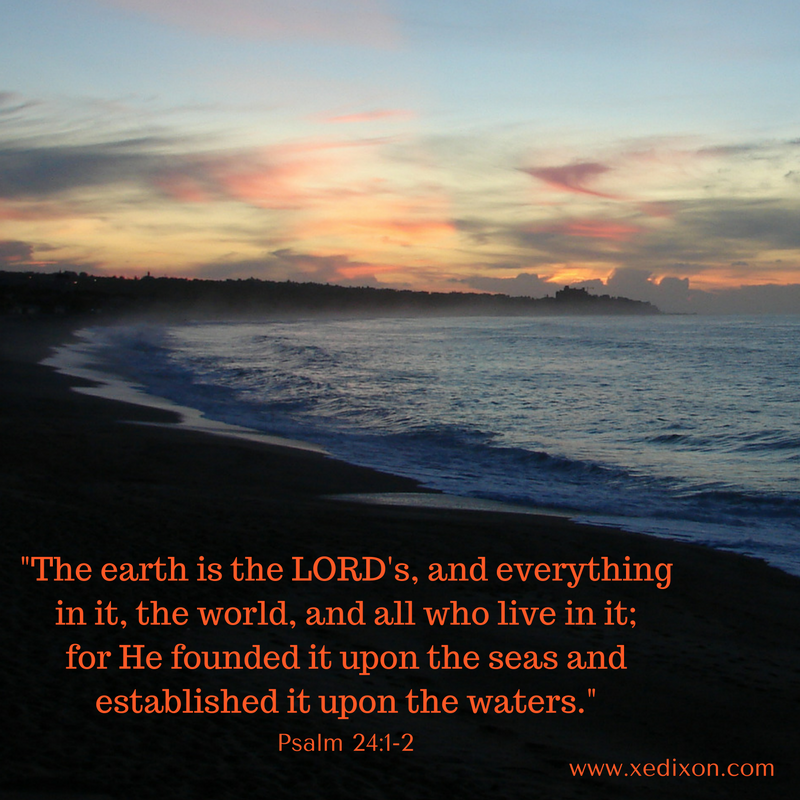 Lord, You are our Rock. When our steps feel unsure, when our balance is shaky, You are our solid foundation. You hold us securely in the curve of Your strong arm. You comfort us with Your unchanging Word, assuring us that Your sovereign care and limitless love never fails, never disappoints, and never falls short of Your perfection. Yes, Lord, You are our stronghold, in times of peace and in times of trouble. 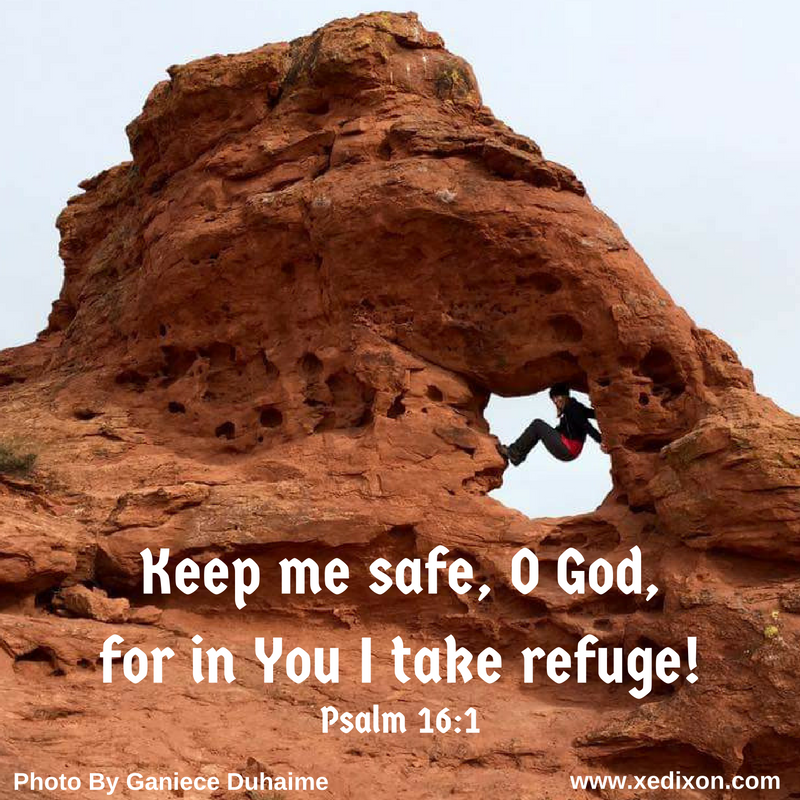 Your past faithfulness reminds us that You can be trusted to be our refuge through the storms. Your constant presence stills the winds of anxiety, no matter what adversity threatens to blow us over. You can handle whatever obstacles we face. Lord, we don’t need to fear. We don’t need to worry. We don’t need to lose sleep over what might be or what is happening in or around us. Help us live in this moment, trusting You to endure, and depending on You to stay true because You are the only Way, the unchanging Truth and the Eternal−our love and our Life. Wonderful Counselor and Good Shepherd, thank You for reminding us we’re safe in the center of Your will. Oh, mighty and merciful God, please help us long for Your shelter, submitting to Your lovingkindness and worshipping You with one breath of praise at a time. Photo provided by and used with permission by model in photo, Jan Tyson. Photo taken by and used with permission by Ganiece Duhaime. Get ‘er Done? Or Get Closer to God? Last year, I invited women to join me in reading through the Bible in a year, something I’ve enjoyed doing since 2005. But when health complications impacted my energy levels, I had to make some changes. After much prayer, God showered me with peace. Accepting my slower-than-a-tortoise pace, I started savoring each God-breathed word in Scripture by highlighting key words and phrases. How had I gotten to the point where these words landed with a thud in the empty well of my heart? How had I forgotten the sacrificial pain endured by the One who died for me, rose for me, lives for me, as He forever guarantees my eternity in the presence of His loving grace? When did I start focusing on slurping up the words of Scripture, instead of spending time with the Person who reveals Himself to me and affirms His love for me through each God-breathed syllable? I’m not the first person in history, and probably won’t be the last, who has confused knowing Bible verses with knowing God intimately and personally receiving Him as ultimate Lord and redeeming Savior. As a Pharisee, Nicodemus would have prided himself in memorizing the Scriptures. But his late night venture demonstrated a longing for more. Proudly familiar with the Scriptures, Nicodemus came to Jesus cloaked by darkness and carrying a bag full of assumptions. Minimizing Jesus’s identity blocked Nicodemus from seeing that only God in the flesh could perform those miraculous signs that perked his interest. The fulfillment of all those Old Testament prophecies pointed straight to Jesus as Messiah. Still, Nicodemus clung to false-understanding. It’s easier to believe what we think we know, what feels safer to say out loud, what doesn’t set us up for risking rejection, heartbreak, or the need to admit we need change. But Jesus led this seeker to the familiar Scriptures that circled right back to the One who stood before Him. Nicodemus had the story of Moses tucked into his bag of Bible knowledge. He could probably recite the verses backwards, with a smug smirk on his face. But could it be true “. . . that everyone who believes in [Jesus] may have eternal life” (v. 15)? Could Jesus referring to what happened with Moses and the Israelites in the desert, mean that He confirmed God’s plan was put in place before the beginning of time? Could God love the world so much that He acknowledged all people deserved death and earned wrath, but still chose to offer the priceless gift of forgiveness through repentance and freedom through Christ, resulting in eternal life? Yes. Yes. And, by God’s endless grace, Yes. God saves us, because there is no way we can save ourselves. The Father never altered His original plan as He paved the way for the Spirit to connect the dots that led to Jesus as the awaited Messiah and Savior of the world. Death never stopped being a requirement for life to be received through the Risen King, our living and loving God. Even today, in a world where evil glorifies people shrouded by sin, death remains a required part of the deal. Death of self-sufficiency, self-righteousness, self-reliance, and self-centeredness. Death of our sinful nature. 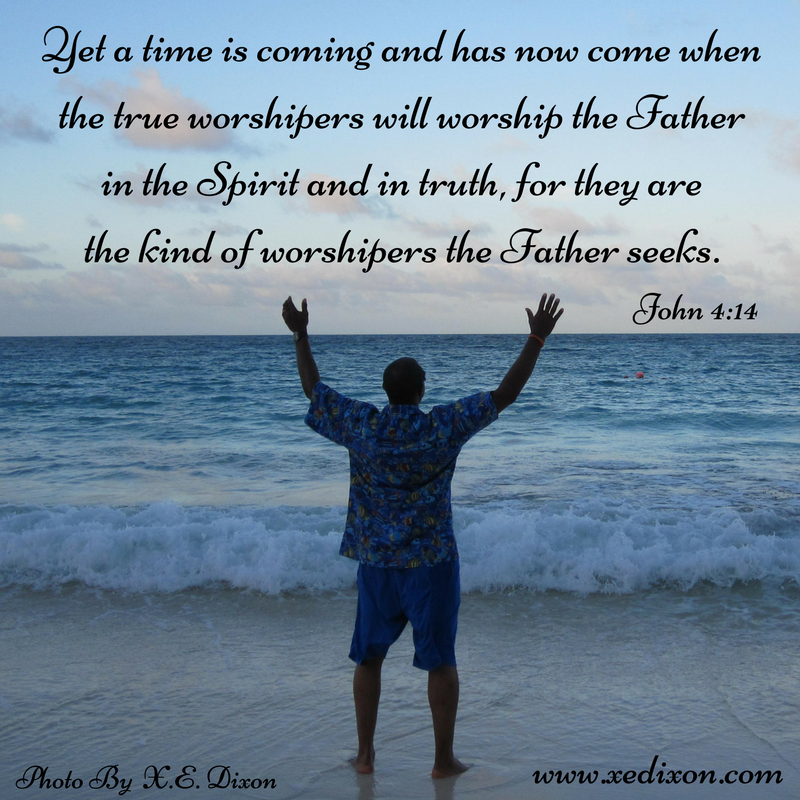 As we foolishly grieve over the death of these things that prevent us from experiencing an abundant life in Christ, God faithfully waits for us to seek Him, to know Him, to love Him. Like Nicodemus, we can become so familiar with Scripture that we miss getting to know the only One to whom Scripture reveals as the Savior this world desperately needs−Jesus. Skimming through the Bible or neglecting the daily reading of Scripture, we risk missing out on the big picture God paints through His whole story. Some important words can fall through the cracks when we dash through assigned readings in a foolish rush to get ‘er done, instead of to get closer to God. But if we approach Scripture as living and active, asking the Holy Spirit to shed the light of understanding on each and every God-breathed word of truth, our personal love-encounters with Christ will changes us forever. How does your approach to Bible reading change when you focus more on getting to know God instead of getting ‘er done? Mighty and loving Father, You gave us life and everything . . . everything . . . yes, everything we have. Please increase our gratitude for the things we often take for granted, for the circumstances we’re in, and the even for the experiences that make up our testimony of faith. This world is Yours, Lord. You created every person with love, with a purpose, and with special role in Your larger than life plan. We all belong to You and are loved by You, whether we submit to You or not. Please forgive us for our moments of weak, complacent, or even nonexistent faith, almighty God and Creator. When we doubt Your vast power, please draw our eyes to the heavens and our thoughts to the depth of the sea. Help us recognize the intricate designs of this complex world You created. When we’re tempted to focus on the bad things that happen in this fallen world, all the hurt and the heartache, the injustice and evil, please help us rest in Your constant presence and acknowledge You own it all, control it all, and can handle it all in love. Help us think about all You’ve done in the past as we trust Your faithfulness. Help us remember the sweet breath of a baby, Your masterful artwork displayed in nature, and the love only explainable and possible because You first loved us. We are Yours, Lord. This world and everything in it is Yours, all Yours. Thanks for loving us so much that You share what You have, providing everything from the air we breathe to the clothes we wear to the relationships we enjoy. Please help us trust You so much that we can’t help but give to You with grateful and generous hearts. Oh, Lord, how we need You. Sometimes, it’s easy to feel like we’re drowning in the deep waters of busyness, fear, discouragement, insecurity, weariness, anxiety, or any other emotional turmoil that churns in our hearts. Sometimes, it’s easy to forget it’s not really up to us to be, or even to feel, strong enough to hang on to You. It’s too easy to think we determine the measure of our faith. We’re deceived into believing we’re responsible for being able to walk, in our own strength, by that unshakable faith You say is our inheritance. But, Lord, please help us remember You’re the only One with a good grip. When we can’t hold on to You, when we feel like we’re slipping away from believing Your promises, we can trust You’ll never let us go. When we’re sinking in troubles that feel like their miles in depth, but are less than an inch deep to you, please help us lift our arms up in complete surrender. Help us cry out for Your merciful love, knowing we can count on You to reach down and meet us wherever we are in the moment. Sometimes, the tides of this world seem to drag us down, further away from You. Help us know Your faithfulness assures us that we’re held safe in Your firm, yet gentle grip. Your grace never fails us, Lord. Your watch never ends. Your strength remains as unmatched as Your glory. Mighty Jesus, You are worthy of honor! You are worthy of our unadulterated, loving obedience and trust. The moment our chins break the surface that separates the troubles of this world from Your everlasting hope, please fill our lungs with the fresh air of faith that inspires us to worship You with exuberant and infectious joy. Photo taken and meme created by Xochitl E. Dixon. Sovereign God. Almighty King. Good Shepherd. Loving Creator. Great Physician. Caring Father. Provider. Redeemer. Deliverer. Savior and Friend. You are everything to us. Lord. Thanks for inviting us to get to know You personally, even though we’ll never be able to understand You completely. Thank You for revealing Yourself to us, as You help us to be more sensitive to Your Holy Spirit’s nudging. Open our hearts and minds as we watch You working in and through our lives, as well as the lives of Your people in Your Holy Word and all around us. Thanks for offering us opportunities to encounter Your love intimately. Please help us to be aware of You and grateful for the gentle ways You show Yourself to us personally. Make Your constant presence known to us throughout the day. We’ll never be able to figure out how You work, or even why You do the things You do. We’ll never be able to know why You allow us to endure certain circumstances. But we can always rely on You and count on Your love to prevail. We can always depend on Your unchanging character, Your infallible Word. We can always know, without a doubt, that our hope is irrevocably secured in Your endless grace. Please help us trust You, no matter how much we have yet to understand.